Lavender bag making is very simple. Coming from the lavender fields of Provence, the dried lavender we recommend is high in essential oils, and therefore highly fragrant. The bags can be used as an insect repellant in cupboards, to freshen drawers, or to aid sleep and relaxation. Lavender bags make very popular wedding favours. A simple lavender bag can be sewn from offcuts of fabric, and either sewn shut after filling, or sealed with velcro or a drawstring ribbon. Resealable bags can be re-filled or refreshed more easily. 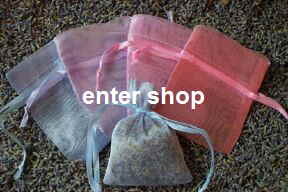 To fill the bags you can choose pure dried lavender (this is what we use). Or if you are on a budget, you can mix it with wheat or dry rice mixed with a few drops of lavender oil. These produce a more weighty bag. Lavender bags made with wheat can be warmed in the microwave to produce an alternative to the hot water bottle. Such bags should be made of sturdy cotton and carefully stitched to avoid leaking. Microwave with care, as if left too long, will overheat. Large pillows and cushions can be made by inserting a lavender pouch between foam pads. Lavender pillows can aid sleep, whereas lavender cushions will keep your living space fresh! If you have had it less than 3 months, just squeeze to refresh. If you have had it longer than this you can either replace the lavender, or remove the lavender and mix it with a couple of drops of lavender oil (cautiously to avoid staining). How much dried lavender do I need?